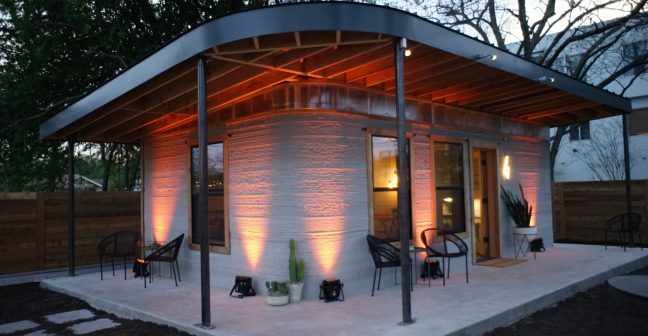 A US based company has designed a home that can be built in 24 hours by using a giant 3D printer. The house, which costs less than $4,000, could help to provide affordable housing around the world. The incredible house is the creation of construction firm Icon who teamed up with non-profit New Story to create affordable printable homes. Although it’s still just a concept, the house was unveiled this week at South By Southwest in Texas. The house is printed using the Vulcan 3D printer, which the firm says could one day be used to build homes each measuring between 650-800sq ft.
Icon says the building is tested to the necessary safety standards and could help “end homelessness”. The company describes the home as a “quantum leap in affordability”. “This isn’t 10% better, it’s 10 times better”, co founder Jason Ballard told The Verge. The company eventually aims to help house the “nearly one billion people without safe shelter globally”. The company predicts that eventually its technology will be used to provide housing on “off-planet space habitats”.